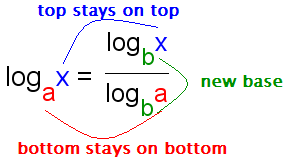 Change of Base Formula: A formula used to change the base of a logarithm. The change of base formula is used to change the base of logarithms. The change of base formula is . When logarithms were first invented, there were no calculators. Mathematicians and astronomers used books published with tables of logarithms. Each table had exactly one base. To find a logarithm with another base, they used the change of base formula. Today, most calculators and math based computer programs have logarithms in two bases: base 10 and base e. To find a logarithm in any other base, one must use the change of base formula. Figure 1: Change of base mnemonic. McAdams, David E.. Logarithm . allmathwords.org. All Math Words Encyclopedia. Life is a Story Problem LLC. 6/27/2018. http://www.allmathwords.org/en/l/logarithm.html. McAdams, David E. Change of Base Formula . 4/13/2019. All Math Words Encyclopedia. Life is a Story Problem LLC. http://www.allmathwords.org/en/c/changeofbaseformula.html.